Last year we announced the Indie Games Accelerator, a special edition of Launchpad Accelerator, to help top indie game developers from emerging markets achieve their full potential on Google Play. Our team of program mentors had an amazing time coaching some of the best gaming talent from India, Pakistan, and Southeast Asia. We’re very encouraged by the positive feedback we received for the program and are excited to bring it back in 2019. Applications for the class of 2019 are now open, and we’re happy to announce that we are expanding the program to developers from select countries* in Asia, Middle East, Africa, and Latin America. This entry was posted in Google Developers Blog and tagged android developers, Featured, Google Play, Indie Games Accelerator, Launchpad Accelerator on April 17, 2019 by Google Developers. This entry was posted in Android Developers Blog and tagged Android, android developers, Featured, Google Play, Indie Games Accelerator, Launchpad Accelerator on April 17, 2019 by Android Developers. This entry was posted in Android Developers Blog and tagged Android, Android Q, Android Q Permissions, Developer Accounts, Developer Feedback, Google Play, permissions, Policy, Policy Enforcement on April 15, 2019 by Android Developers. This entry was posted in Official Google Blog and tagged Google Play on April 15, 2019 by The Official Google Blog. Since launching on Google Play nearly 7 years ago, subscriptions have proven to be an essential element in creating sustainable mobile app businesses; 89 of the top 100 highest grossing apps on Google Play in the US now provide subscription products. As the market matures, it is becoming increasingly important for subscription developers to optimize both subscriber conversion and retention in order to maintain growth. To help you do that, we're rolling out new insights available directly in the Play Console. Example subscription retention report data in the Play Console. Source: Google Internal Data. 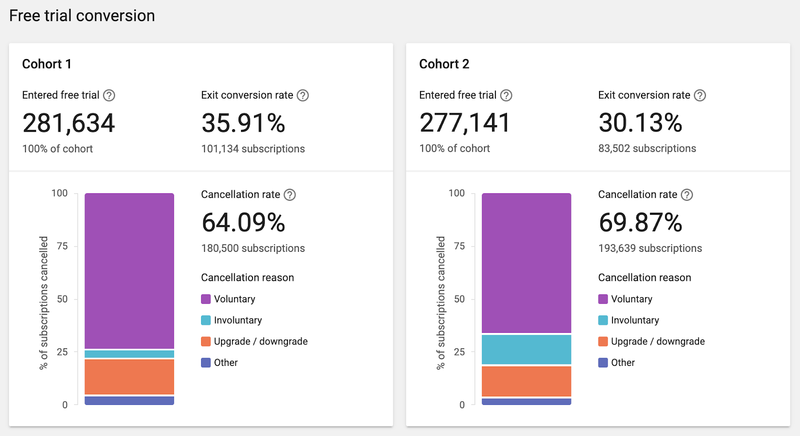 The recently updated subscription retention report shows how well you are retaining subscribers, along with how well subscribers convert from free trial, introductory price, and first to second payment. You can configure two cohorts based on SKU, country, and subscription start date. This is particularly useful for evaluating the success of A/B tests; for example, to determine if changing the duration of a free trial has an impact on free trial conversion. Example free trial conversion data in the Play Console. Source: Google Internal Data. Retaining your existing subscribers is just as important as acquiring new subscribers, so we have updated the subscription cancellations report to give more insight into voluntary and involuntary cancellations. 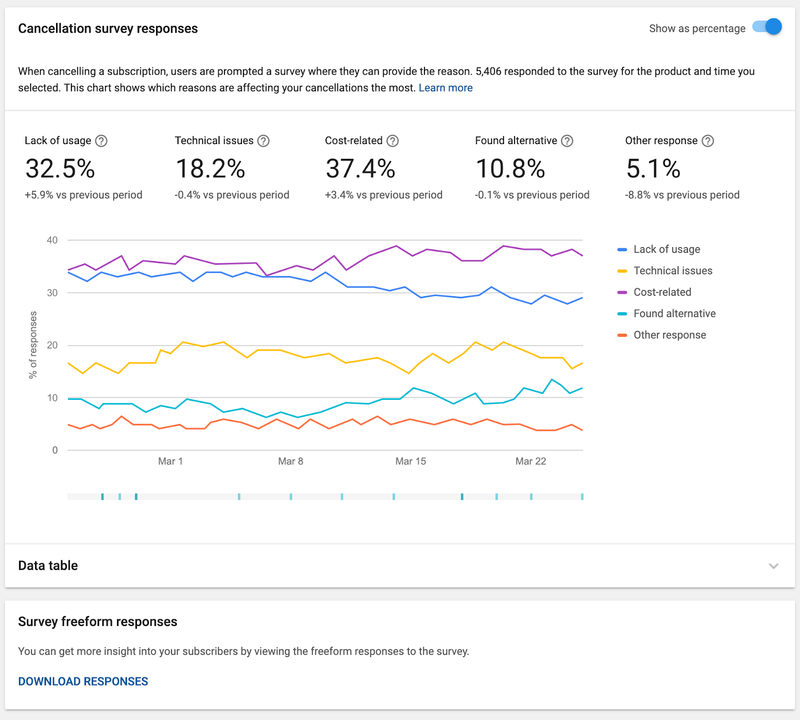 The launch of the subscriptions center last year introduced a cancellation survey allowing users to give developers feedback as to why they were cancelling, with results available through the Google Play Developer API. To make these results easier to access and monitor, we now surface daily aggregates directly within the Play Console, along with the ability to download written responses in a CSV. Example cancellation survey responses in the Play Console. Source: Google Internal Data. Involuntary cancellations, which occur when a user's form of payment fails, account for over a third of all cancellations. 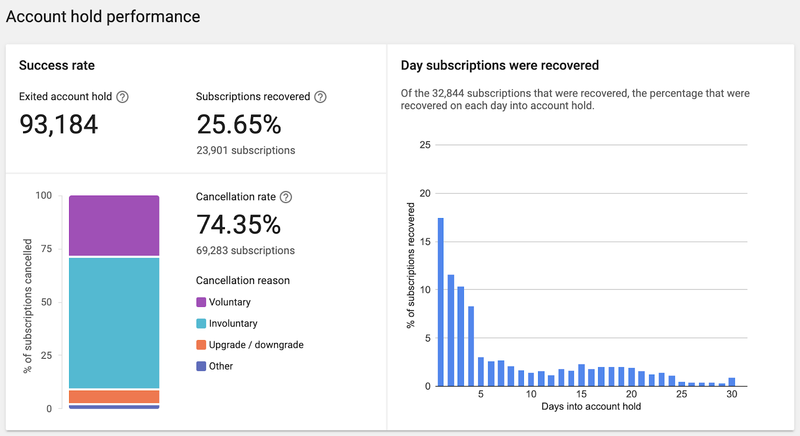 The new recovery performance cards in the cancellation report helps you understand how effectively you are recovering users with grace period and account hold, and the day the subscriptions were recovered to help you evaluate the effectiveness of recovery messaging. Example account hold performance recovery card in the Play Console. Source: Google Internal Data. Make sure you've set up grace periods and account hold for your apps! We've seen that developers who use both grace period and account hold see more than a 3x increase in decline recovery rate from 10% to 33%. Discover more information on grace period and account hold. You can find the subscription retention and cancellation reports linked from the bottom of the Subscriptions page, in the Financial reports section of the Play Console. If you don't have access to financial reporting, ask your developer account owner for permission to view financial data. 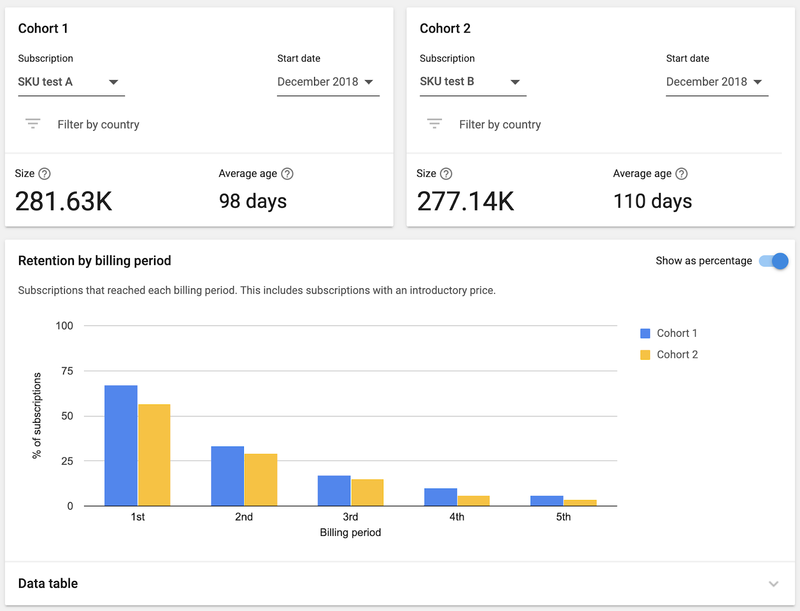 We hope this new reporting gives you new insights to optimize your subscription business, and we look forward to sharing more with you at Google I/O in May. This entry was posted in Android Developers Blog and tagged Android, android developers, Featured, Google Play, monetization, subscriptions on April 11, 2019 by Android Developers. 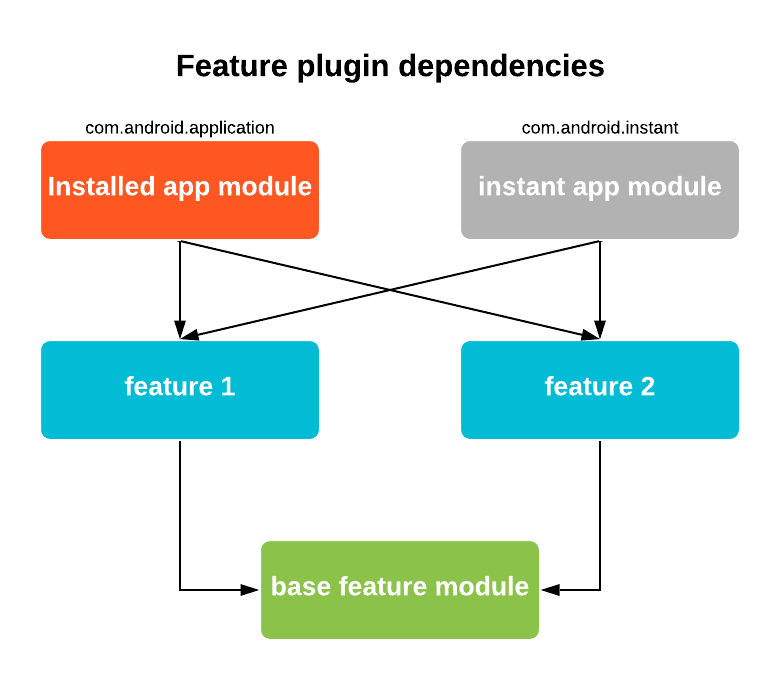 As of Android Gradle plugin 3.4.0 (included in Android Studio 3.4), we are starting the deprecation process of the feature plugin (com.android.feature) and instant app plugin (com.android.instantapp) as a way to build your instant app. When building your app, you will receive a warning flagging com.android.feature as deprecated. If you have an existing instant app built with the feature plugin, migrate your existing app to an instant-enabled app bundle as soon as possible. Last year, we introduced Android App Bundles—a new way to build and publish your Android apps. App bundles simplify delivering optimized APKs, including instant delivery, by unifying uploads into a single artifact. Google Play handles distribution by serving the correct APKs to your instant and installed app users—this is called Dynamic Delivery. To learn more about app bundles, visit the documentation site. By migrating your instant app to an instant-enabled app bundle with dynamic features, you will be ready to leverage the full power of this new paradigm and you will be able to simplify your app’s modular design. an instant app module, which represented the instant app and mapped its dependencies. With the new app bundle implementation, your base feature module takes the role as your app module (com.android.application), hosting the code and resources common to all features (instant and installed). You organize additional, modular features as one of three types of dynamic feature modules, based on when you want to deliver them to the user. The instant app module disappears, since the dist:instant attributes in the manifest are enough to identify which features will be included as part of the instant experience. If you don’t have an instant experience added to your app and you’d like to create one, use Android Studio 3.3+ to create an instant-enabled app bundle. This entry was posted in Android Developers Blog and tagged Android, app, App Bundles, deprecation, dynamic delivery, Featured, Google Play, Google Play Instant, instant experience, Plugin on April 9, 2019 by Android Developers. This entry was posted in Android Developers Blog and tagged Android, Android App Bundles, android developers, App Bundle, app signing, Distribute, dynamic delivery, Featured, Google Play, i18n, internationalization, l10n, language, Localization, play core, Translation on March 21, 2019 by Android Developers. 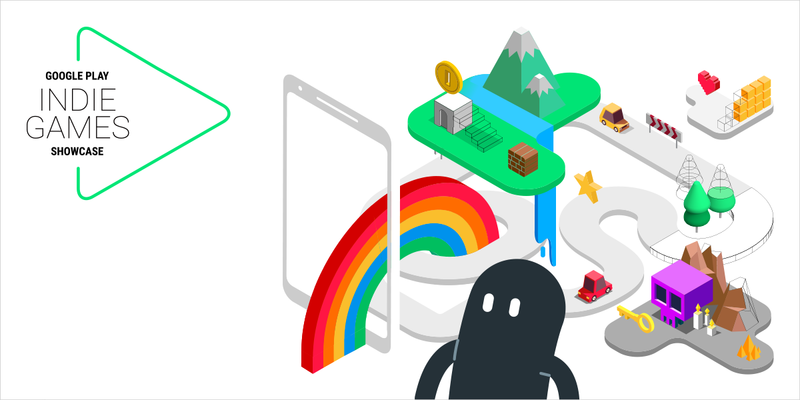 Google Play empowers game developers of all sizes to engage and delight people everywhere, and build successful businesses too. We are inspired by the passion and creativity we see from the indie games community, and, over the past few years, we've invested in and nurtured indie games developers around the world, helping them express their unique voice and bring ideas to life. This year, we've put together several initiatives to help the indie community. A paid trip and accommodation to the final event in your region to showcase your game. Promotion on the Google Play Store. Promotion on Android and Google Play marketing channels. Dedicated consultations with the Google Play team. If you're over 18 years old, based in one of the eligible countries, have 30 or less full time employees, and have published a new game on Google Play after 1 January 2018, you can enter your game. If you're planning on publishing a new game soon, you can also enter by submitting a private beta. Submissions close on May 6 2019. Check out all the details in the terms and conditions for each region. Enter now! Last year we launched our first games accelerator for developers in Southeast Asia, India and Pakistan and saw great results. We are happy to announce that we are expanding the format to accept developers from select countries in the Middle East, Africa, and Latin America, with applications for the 2019 cohort opening soon. 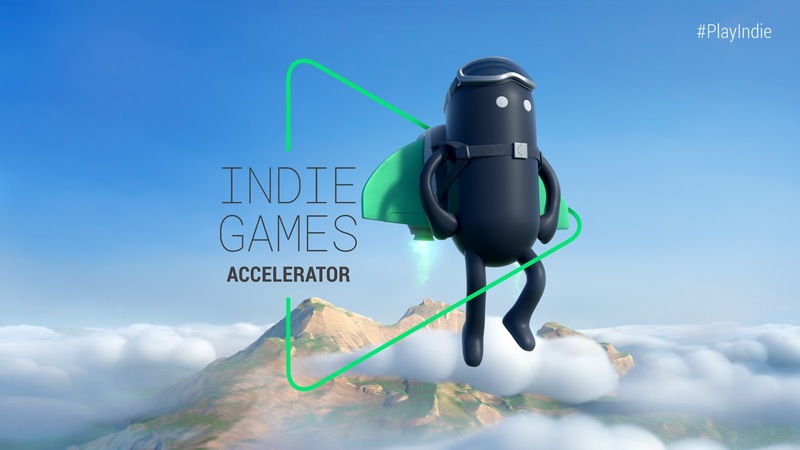 The Indie Games Accelerator is a 6 month intensive program for top games startups, powered by mentors from the gaming industry as well as Google experts, offering a comprehensive curriculum that covers all aspects of building a great game and company. We will be hosting our annual Developer Day at the Game Developers Conference in San Francisco on Monday, March 18th. Join us for a full day of sessions covering tools and best practices to help build a successful mobile games business. We'll focus on game quality, effective monetization and growth strategies, and how to create, connect, and scale with Google. Sign up to stay up to date or join us via livestream. We also want to engage with you in person with a series of events. We will be announcing them shortly, so please make sure to sign up to our newsletter to get notified about events and programs for indie developers. Looking for tips on how to use various developer tools in the Play Console? Get free training through our e-learning program, the Academy for App Success. We even have a custom Play Console for game developers course to get a jump start on Google Play. We look forward to seeing your amazing work and sharing your creativity with other developers, gamers and industry experts around the world. And don't forget to submit your game for a chance to get featured on Indie Corner on Google Play. * The competition is open to developers from the following European countries: Austria, Belgium, Belarus, Czech Republic, Denmark, Finland, France, Germany, Israel, Italy, Netherlands, Norway, Poland, Romania, Russia, Slovakia, Spain, Sweden, Ukraine, and the United Kingdom (including Northern Ireland). This entry was posted in Android Developers Blog and tagged Android, android developers, Business, Competition, Developer, Europe, Event, Featured, Games, Google Play, grow, indie, Indie games showcase, Indie showcase, indies, Japan, prizes, showcase, South Korea, win on March 13, 2019 by Android Developers.